Rachael comes from Oldham and she was brought up in the Saddleworth area. She studied at The Royal Northern College of Music, where she gained a first class degree with Principal Study in Academic Studies and she won an Arts and Humanities Research Council scholarship for further study. She completed a Ph.D on the operas of Dame Ethel Smyth (1858-1944) at The University of Manchester. Rachael has performed concertos in Yorkshire, Berkshire and Dorset and she regularly plays chamber music with her quintet, the Elmet Quintet and with various trios, including the Leonora Trio, consisting of piano, cello and clarinet. 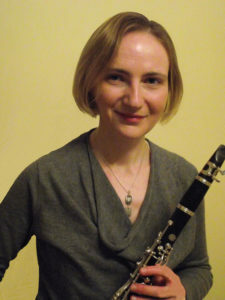 She is a soloist each year at Charterhouse Summer School of Music and has performed on both the clarinet and piano in a wide range of lunchtime concert series in the North West.